For years small to medium-sized shippers have endured the higher cost of LTL carriers because they lacked the volume to ship full truckloads. Today, more lower-volume shippers are leveraging the matchmaking capabilities of 3PLs for freight consolidation – creating full truckloads stuffed with freight from multiple companies shipping to the same place. 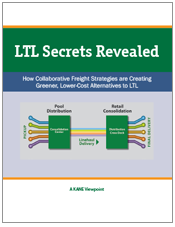 This KANE white paper shares some secrets that LTL carriers don’t want you to know and provides examples of how pool distribution and freight consolidation strategies are enabling faster, cheaper, greener alternatives to LTL freight.